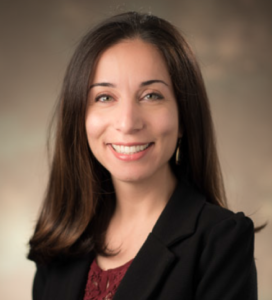 The Lobular Breast Cancer Alliance is pleased to share a new surgical study and interview with lead study author Dr. Rita Mukhtar of University of California San Francisco. 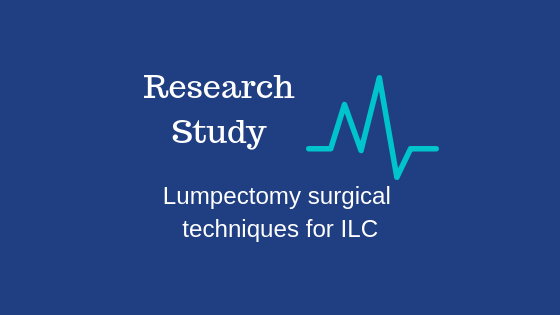 Lobular Breast Cancer (ILC) is notoriously difficult to image due to its diffuse cellular pattern, which leads to difficulties in achieving clear margins in breast conserving surgery. This can result in multiple surgeries to remove the tumor and/or mastectomies. This study indicates that “oncoplastic” surgical techniques (OPS) were associated with a 60% reduction in positive surgical margins, and selective use of “shave margins” was associated with a 61% reduction of positive surgical margins. Dr. Mukhtar, this study indicates that integrating oncoplastic surgical techniques and shave margins can result in more successful breast conserving surgeries as well as a more pleasing aesthetic outcome. Therefore, it is your recommendation that surgeons should routinely consider these techniques in lumpectomies for patients with lobular breast cancer. 1. What is “oncoplastic surgical technique” (OPS)? Oncoplastic surgery means that at the same time as a lumpectomy (partial mastectomy), the remaining breast tissue is moved to fill the empty space. There is a spectrum of how much the tissue is re-arranged, from just a small amount, to a large amount. Taking an oncoplastic approach means that a larger lumpectomy can be performed without leaving a big empty space in the breast. This allows more women to avoid mastectomies. The more breast tissue there is to begin with, the easier it is to re-arrange the remaining tissue. Techniques like oncoplastic reduction mammoplasty are best used in women who have more breast tissue to start with. Oncoplastic surgery can achieve a more aesthetically pleasing outcome by reducing the “empty space” left by the partial mastectomy, so there is less of a “divot” in the breast. It can also allow the breast to be lifted, which some women prefer. 2. What are “Shave Margins”? During a lumpectomy (partial mastectomy), the goal is to remove the tumor with a rim of normal breast tissue around it. This rim of tissue is the “margin,” and if there is no tumor at the edge, that is referred to as “negative margins” or “clear margins.” If it seems like the rim of tissue is too thin on one side, then the surgeon can remove an extra piece of tissue from that side, which is called a shave margin. This is done during the same procedure as the lumpectomy. Other researchers have shown that in general, removing extra margins does reduce the rate of positive margins, but this had not been studied in many women with lobular breast cancer. Our study found that taking these extra pieces of tissue dramatically reduced the rate of positive margins in women with lobular breast cancer specifically. Shave margins can be taken whether or not oncoplastic surgery is performed. 3. Who would be a candidate for this type of surgery? Shave margins can be taken in all women at the time of the initial lumpectomy. Oncoplastic surgery can also be done at the time of the initial lumpectomy; but it is not necessarily possible in all women, since it depends on the size of the tumor relative to the size of the breast, and the availability of a surgeon trained in these techniques. This is something to ask your surgeon about. 4. What are some differences a patient should be aware of using this surgery as opposed to traditional lumpectomy? Taking shave margins is a simple addition to traditional lumpectomy. Adding oncoplastic surgery can make the surgery more extensive. However, there is really a spectrum of oncoplastic surgery, ranging from a very small amount of moving tissue around, all the way to larger procedures like “breast reduction” type operations, which are usually also performed on the opposite breast to achieve symmetry. This is one reason why not all women will be candidates for or want oncoplastic surgery. Oncoplastic surgery or shave margins should not affect sentinel node biopsies or radiation therapy..
5. How would a patient find a surgeon trained and proficient in oncoplastic techniques? The best thing to do is ask your surgeon if they perform these techniques. There are some surgeons who are experienced in both breast cancer surgery and oncoplastic surgery. Other breast cancer surgeons will work with a plastic surgeon as a combined surgery. 6. This study was limited to Stage 1-3 breast cancer patients. Although breast surgery for Stage 4 patients is still debated, can this technique be used in selected Stage 4 patients? These techniques can be applied to any person undergoing breast cancer surgery. Whether or not it will be beneficial for a particular person should be decided on a case by case basis. 7. Given that this is a retrospective study, is there additional research which would be beneficial to learn more about applying these techniques in ILC? The problem with retrospective studies is that we don’t know why some women got shave margins taken or oncoplastic surgery, and others did not. The women and their surgeons decided on the best treatment plan, as opposed to having the treatment plan “assigned” to them the way a prospective randomized trial would occur. This means that there could be some other, unknown reason why these techniques appeared to be beneficial. For shave margins, there is such minimal risk, and so much other data showing the benefit, that it makes sense to make this a standard part of breast conservation surgery for women with lobular breast cancer. For oncoplastic surgery, this is still something that needs to be individualized for a particular woman’s situation. It can come with more risks, since it can add to the extent of surgery. For this reason, each woman should discuss this with their surgeon prior to making a decision about it. Rita Mukhtar, MD is an Assistant Professor of Surgery and is an acute care general surgeon and breast oncologic surgeon at UCSF. Dr. Mukhtar completed her undergraduate education at UC Berkeley, where she studied music and molecular biology. She then attended medical school at UCSF, during which she received a Doris Duke Clinical Research Fellowship and pursued research in the inflammatory response in sepsis, winning a research award. She remained at UCSF for General Surgery residency, and completed a two year post-doctoral research fellowship focusing on the role of inflammatory cells in breast cancer outcomes, funded by the California Breast Cancer Research Program. During this time, she received a scholarship from the UCSF Clinical and Translational Science Institute to complete a certificate in Advanced Training in Clinical Research. After residency, she completed a fellowship in Breast Oncologic Surgery, while serving as a clinical instructor in General Surgery. She currently practices Acute Care General Surgery and Breast Surgery. Her research interest is in genetic causes of breast cancer, prevention, and treatment, and in lobular breast cancer.